When the snow starts falling in the mountains, humans start making the trek up them with boots, boards, skis, and poles in hand. The snow means ski season, and plenty of cannabis consumers have long enjoyed the tradition of consuming their favorite strain before hopping in line for the gondola ride up the slopes. If you’re headed to the mountains this year with the idea that of repeating your yearly tradition, there are some amazing places to do so. Take caution, however, many slopes are located on federal land. So, even if you’re going to a state where cannabis use is legal, that doesn’t mean it’s legal to consume while on the mountain. Thankfully, there are plenty of places to continue your ritual without fearing a heavy-handed smack from the law. Let’s take a look at some of our favorite cities and resorts to enjoy a cannabis-filled ski season this winter. 67 miles west of Denver is where you’ll find one of Colorado’s most popular adventure towns, Winter Park. It’s even more popular with cannabis consumers because the area has multiple dispensaries nearby. In the past it was possible to find ‘smoke shacks,’ but it appears they’ve all been demolished by the authorities. 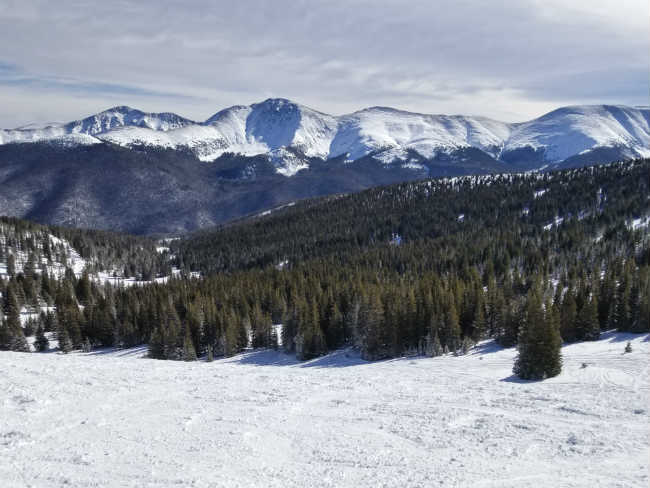 Winter Park has thousands of acres of mountain to explore, and it typically less crowded than some of the other towns you’ll see in this list. If you happen to make it to Winter Park this season, you’ll find friendly locals, incredible food and beer, breathtaking slopes, and of course an atmosphere and location that is perfect for your cannabis consumption. Furthermore, not everyone is an advanced skier or snowboarder. Winter Park has something for everyone. From tame slopes to choppy moguls to massive jumps, every rider is sure to find a line that suits their preferences. After unstrapping your boots and heading inside to warm up, you’ll find that Winter Park is exceptionally welcoming to cannabis enthusiasts. Click here to view PotGuide’s Winter Park travel guide! If you’ve only heard of one place to ride in Colorado, it’s probably Vail. In the past, Vail also had smoke shacks up on its mountain tops. However, since the state has put on its professional cannabis hat and smashed the shacks to bits, you’re not going to find them anymore. You will find some of the United States’ best slopes though. With nearly 200 runs on over 5,000 acres of slopes, Vail boasts something for every level of rider. Unfortunately, Vail has banned dispensaries within their jurisdiction, but this hasn’t stopped a plethora of dispensaries from popping up along what’s known as “The Green Mile.” If you’re keen to visit Vail and stay in a cannabis-friendly accommodation, you can use this tool to find one that’s right for you. While Vail can be a tad pricey for someone looking to enjoy a cannabis and ski vacation on a budget, the price will likely be offset by the incredible runs and stunning views. Click here to view PotGuide’s Vail travel guide and learn where to buy, where to stay and what to do! Aspen is perhaps the other ski town you’ve heard of other than Vail. It’s a well-known town with plenty to do. When it comes to cannabis, there’s no shortage. In fact, Aspen has multiple dispensaries in the heart of the city all within a few blocks of each other. While the city is most famous for catering towards the rich and famous when they want to get away from the big city, there’s plenty to enjoy about it for us common-folk, too. Of course, the ski slopes are gorgeous, but they’re also on federal land. As we’ve discussed, consuming there is a big no-no. Should you want to consume before you head to the mountain, however, that’s your prerogative. With the freedom to do as you choose, Aspen is an awesome place to enjoy the cold weather in the best way you know how: with your favorite strain and enjoyable outdoor activities. Want to get an inside look into cannabis culture in Aspen? Click here to check out PotGuides Aspen travel guide. Breckenridge hosts five gigantic mountain peaks and nearly 3,000 acres of slopes to explore. Not only that, this area generally gets over 30 feet of snowfall each year. That means you’re likely to find a run with some fresh powder on it no matter when you go. From simple runs for the beginners to runs that take you well above the tree line, there’s something for everyone. Thankfully, the town also has something for cannabis consumers. To find the greenery that’s available under the mountains of white snow, just head slightly north of town, near Airport Road, and you’ll find a small litany of medical and recreational cannabis dispensaries. With a strain for every person and slope for every rider, Breckenridge is a ski-town that leaves everyone with a warm feeling inside no matter how cold it gets outside. Click here to browse PotGuide’s Summit County travel guide featuring Breckenridge! What was once a silver mining camp is now home to a plethora of outdoor activities. While you could spend the day sampling fine cuisine and checking out the Victorian-era houses, many come to Telluride to enjoy its relaxed, cannabis-friendly atmosphere. The rugged mountains make for exhilarating skiing and snowboarding opportunities, and ending your day in the quaint town is a wonderful way to spend your winter holiday. While there’s more to do in Telluride than consume cannabis, go skiing, and laze around town, there’s no doubt that Telluride is one of the better ski-towns in terms of cannabis. Telluride Bud Company was one of the first dispensaries to open in Colorado and has remained a beacon for quality cannabis you can procure from a family-owned operation. Click here to view PotGuide’s exclusive Telluride travel guide! We would have loved to include some of the incredible places to visit in California on this list. But, places like Tahoe have indicated that they aren’t interested in letting their companies do cannabis business this year. So, this year’s best state for cannabis and skiing goes to Colorado, which is why you’ll find the best cities in Colorado on this list. What’s your favorite cannabis-friendly ski town? Share them in the comments below!